Just Where is The Prostate? 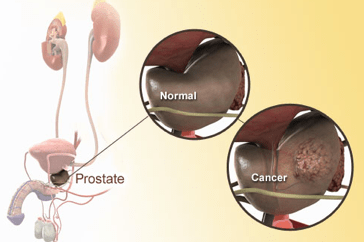 When I was diagnosed with prostate cancer 11 years ago, I had no idea what a prostate was or even where it was located. All I knew was that apparently it could kill me. And when I began talking with my doctor getting my head around everything was a real emotional trip. I just found this slide presentation on WebMD and it’s very good. If you’re a guy and you are reading this post, you likely are a prostate cancer survivor or concerned that you may have prostate cancer. Even if you don’t fit one of those two cases, take 3 minutes are go through these 26 slides. They could save your life or the life of someone you know. When you finish, pop over to ProstateTracker.org and activate your free prostate cancer early detection system.